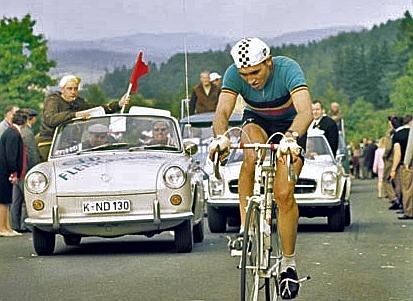 Merckx finished in twelfth position in the men's road race at the 1966 UCI Road World Championships. 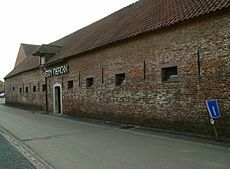 At the 1967 Giro d'Italia Merckx won his first Grand Tour stages on the way to finishing ninth overall. 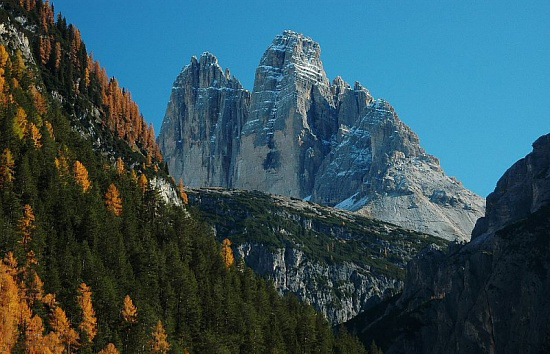 During the twelfth stage of the 1968 Giro d'Italia, Merckx caught the leading group, passed them, and rode solo to the stage finish atop the Tre Cime di Lavaredo (pictured) in poor weather to win the stage and take the race lead. The Velodrome Eddy Merckx at Mourenx was named in honor of Merckx in 1999 due to his efforts during the seventeenth stage at the 1969 Tour de France. 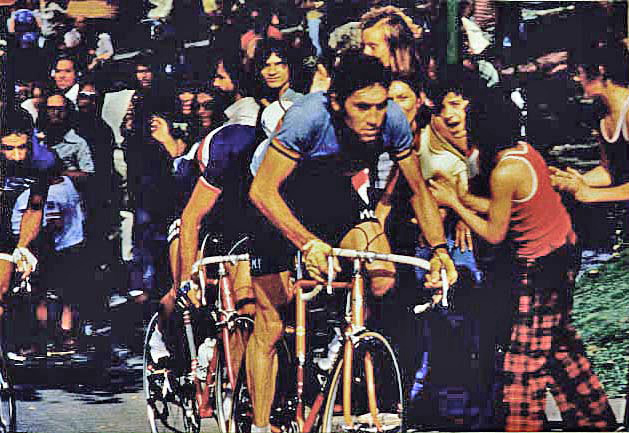 After winning the fourteenth stage to the summit of Mont Ventoux during the 1970 Tour de France, Merckx had to be given oxygen. 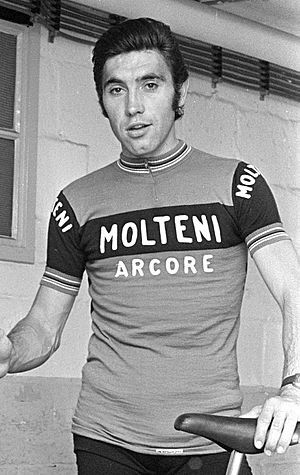 Spaniard Luis Ocaña (pictured at the 1973 Tour de France) was one of Merckx's major rivals during the 1971 Tour de France. While descending the Col du Cucheron during the ninth stage of the 1971 Tour de France, Merckx suffered a puncture. Seeing this, his rivals attacked and wound up gaining 1' 30" on Merckx. Felice Gimondi (pictured in 1966) won the men's road race at the 1973 UCI Road World Championships, ahead of Merckx who was unable to contest the final sprint to the line, finishing last out of the leading group of four. 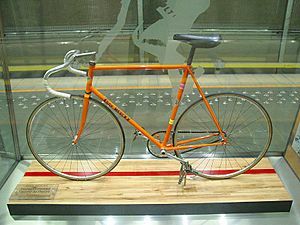 With his victory in the men's road race at the 1974 UCI Road World Championships and his victories in two Grand Tours, the Giro and Tour, Merckx became the first rider to win the Triple Crown of Cycling. Merckx (pictured in 2010) was a successful cyclist on the road and on the track, with 525 victories to his credit over the course of his career. Eddy Merckx Facts for Kids. Kiddle Encyclopedia.